Our mission is to provide knowledge creation activities for Unitec’s communities by delivering superb services, resources, spaces and places. We are here to help you. Unitec library consists of three library branches. Our curriculum focused collection varies from branch to branch in accordance with what is taught at that location. See our hours, locations and maps. Unitec Library services and resources are provided to meet the teaching, learning and research needs of Unitec’s students and staff. Every authorised user of the Library’s services and resources has both a right to work without undue disturbance or distraction and a duty to respect the rights of others. The Library policy details these rights and duties and is written for the benefit of all Library users. See the Library policy. Our specialist information librarians will help you find the material you need. You can make an appointment with your knowledge specialist via email or live chat. 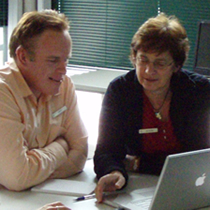 We also offer workshops for classes on how to locate, evaluate and use information effectively. These can be tailored to particular course requirements. Alternatively, use our online tutorials which explain how to use the catalogue and research databases. Use your student or staff ID card to borrow items. You are able to access your borrowing information (including any fines owing) and request and renew items by logging in via the "My Library Record" link on the top left menu of this website or top menu of the catalogue. Remember to log out if you are using a public terminal. More about logging in and using our catalogue. Our people are librarians with excellent professional, academic and often technical skills, and wide ranging experience relevant to the academic environment we work within. We are passionate about helping students develop and succeed. Library assistants and supervisors in our Customer Services teams are skilled in the library's automated circulation system and understand student needs and pressures, especially as many are recently students themselves. They look after all the borrowing and renewing, meeting room bookings, card top ups, fine payments and related enquiries. Plus they provide vital course reserve services. Our Library Knowledge Specialists are highly qualified research and subject specialists, who work closely with students and staff, providing guidance and training especially in the use of our catalogue and electronic resources. The Resources team are technical specialists who work behind the scenes purchasing and processing books and journals, and managing electronic resources. To find the key contacts and our team and staff listings, see the Contact Us page. We are located at the north and south ends of the Mt Albert campus, as well as at Waitākere. More about our locations and how to find us.